Task: To improve productivity on a manual palletising operation that involved relatively heavy paper and polypropylene sacks and was operating 24 hours a day, six days a week during busy periods. The solution needed to be completely automated in order to eliminate the health and safety risks associated with manual palletising. Solution: To design a fully automated packing and palletising line with a FANUC M410iC/185 palletising ROBOT at its core. The ROBOT’s high cycling speed and 185g payload, made it ideally suited to Askew & Barrett’s requirements. Result: The M410iC/185 has increased palletising speed to 10 bags per minute, and has enabled the company to reduce the working week from six days to five without laying anyone off - staff have been redeployed to less physical tasks. Bags are now stacked more consistently onto pallets allowing for safer storage within the warehouse and easier loading into containers. M410iC/185’s has compact 610 x 806mm footprint and extended reach capabilities. “It takes it out of you, standing at the end of the line, stacking sacks onto a pallet. We wanted to take steps to ensure the physical wellbeing of our employees,” says production and warehouse manager Chris Askew. In a dual cell configuration, the robot is sited so that it can swivel between two individually accessible pallet loading positions. The first FANUC M410iC/185 universal palletising robot has been installed in the UK at pulse processor Askew & Barrett, where it has helped to boost productivity by 15-20% and eliminated a potential health and safety risk factor by automating a manual palletising operation. Askew & Barrett sources pulses from key agricultural merchants and then sorts, cleans and grades them at its processing plant in Wisbech, Cambridgeshire. The pulses are bagged into 12.5kg and 25kg paper sacks and 25kg woven polypropylene (WPP) sacks, before being palletised and transported to food manufacturers and retailers at home and abroad. Prior to investing in the new generation FANUC palletising robot, Askew & Barrett used manpower to stack the sacks onto pallets. The problem was that in order to keep up with demand, during busy periods Askew & Barrett was having to operate the line 24 hours a day, six days a week. Although the working day was split into either two 12 hour or three eight hour shifts, this was still physically demanding work, and the company didn’t want to continue exposing its staff to that level of manual handling. Askew & Barrett engaged Pacepacker Services, FANUC’s palletising integrator, to design a fully automated packing and palletising line that would reduce manual handling and increase productivity. For the palletising element, Pacepacker specified FANUC’s new M410iC/185, the first of a new generation of Japanese-engineered palletising robots that combines FANUC’s proven 99.99% reliability record with tangible improvements in performance, allowing users across a range of industries to palletise heavier loads faster and stack pallets higher. FANUC recommended this model on account of its high cycling speed - the robot is capable of 1700 cycles per minute - and its 185g payload. This combination results in heightened productivity and more efficient palletising of heavy payloads. 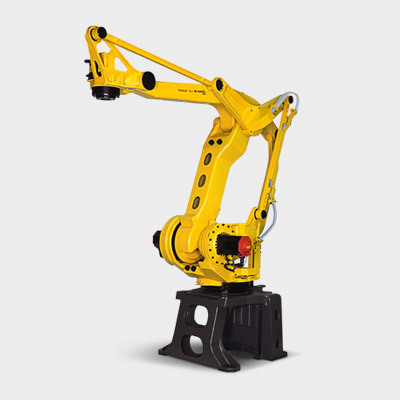 “In designing the M410iC/185, FANUC’s engineers have harnessed the latest advancements in servo motors and drives to design a robot arm that is quite simply best in its class on every front: speed, payload, energy-efficiency and reach. We have absolute confidence that this robot will continue to exceed Askew & Barrett’s performance expectations and prove completely reliable for years to come,” said Paul Wilkinson, business development manager at Pacepacker Services. . The robot was installed in a dual cell configuration for maximum performance, and it is here that the M410iC/185’s compact 610 x 806mm footprint and extended reach capabilities come into play. In a dual cell configuration, the robot is sited so that it can swivel between two individually accessible pallet loading positions. This means that as soon as the robot has finished palletising a stack, it starts to palletise on the other pallet in the cell. “This is an extremely time-efficient configuration as the robot is always in use - it can start loading a new pallet while the full pallet is being transported to the delivery area. The M410iC/185 is ideal for dual cell installations owing to is small footprint and its reach of 2.4m - higher than any other robot in the same class - which enables it to service two cells effortlessly,” explained FANUC UK technical manager Darren Whittall.